I’ve decided to add another category to my blog, aptly named “Coffee tools” in anticipation that there are some readers of my blog that just want to know about the stuff needed to make coffee. Anyway, what better tool to start with than a La Marzocco coffee machine. I’m not really going to go too technical here because I only feel comfortable sharing stuff that I really understand and as I didn’t major/study in-depth any sciences especially engineering, I’m not going to bore you with stuff that you will need a dictionary to understand. OK ! 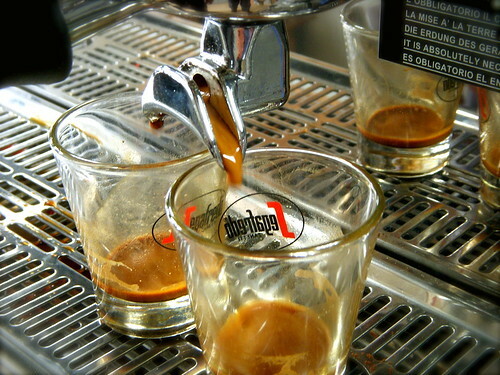 La Marzocco espresso machines are generally what top baristas believe to be the best machines for making espresso and espresso based drinks. Their machines are used at the World Barista Championships to determine who is the best barista in the World. Of course, there are many good espresso machines like the Synesso Cyncra, which coincidentally is designed by a former La Marzocco engineer. 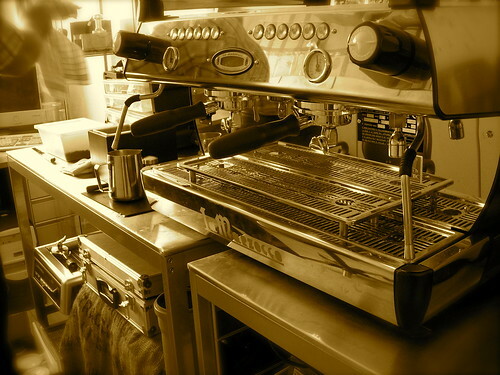 There are other machines and of course many opinions but, the consensus is on La Marzocco. In any case, I had the opportunity to meet with La Marzocco’s main rep in Austria, based in Vienna. It is run by Mr Reinhold Fliedl who supplies coffee machines and other stuff under the name Espresso Solutions. I had already met Reinhold when I bought a La Marzocco bottomless filter-holder and so this was our second meeting. His company was on the other side of Vienna and I took the opportunity to get a half day off from work on a Monday morning – more sleep for me. Anyway Reinhold is a really nice guy and he really knows his stuff when it comes to espresso, coffee, coffee machines and coffee grinders – he owns a La Marzocco GS3 – the only espresso machine suitable for the home made by La Marzocco and costing about 4,000 Euros ($6,000). I learned a lot from him as I was also looking to buy a new coffee grinder too and he talked to me about his two-group head La Marzocco GB5 (one of the best machines made by La Marzocco), which looks really nice. He did a few practice runs on different types of coffee for espresso. A couple of cappuccinos later and an espresso, I was coffeed-up for a few hours and we got talking about beans, roasting and grinders, as well as the poor state of affairs in Vienna with regards to getting really good espresso and espresso based drinks. Reinhold was so serious about this that when we met in mid-June, he was planning a trip to the World Barista Championships in Copenhagen to register through examinations to become an Speciality Coffee Association of Europe (SCAE) trainer. I can gladly report that he passed and he is now one of only three in Austria. 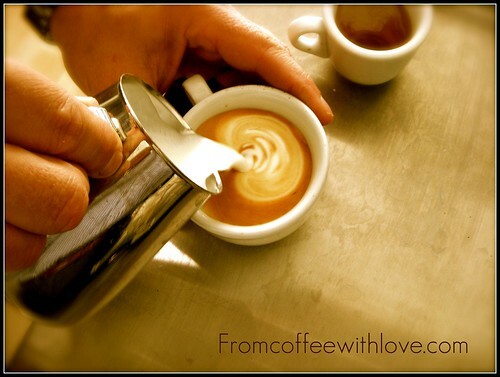 A coffee school is planned, which I hope to attend God willing if it is set up very soon. This entry was posted on Wednesday, July 2nd, 2008 at 6:21 pm	and posted in Coffee Tools. You can follow any responses to this entry through the RSS 2.0 feed.